MySpace Advertising, a sort of Google AdWords for the MySpace community, has launched in Beta. The minimum price is $0.25 per click and the minimum budget required for each campaign is $25. I created an account to test it out by running some ads for Affiliate Summit. While they tout it as a way to “Promote Your Business”, there aren’t really options for promoting a B2B play. None of the categories were relevant for me, and the only tangentially related sub-category I could find was to target people interested in books by Malcolm Gladwell. Then again, MySpace isn’t the first or even 78th place I’d typically go to promote Affiliate Summit. I just wanted to skip through and see the interface. I’ll jump back later to create some real affiliate campaigns. 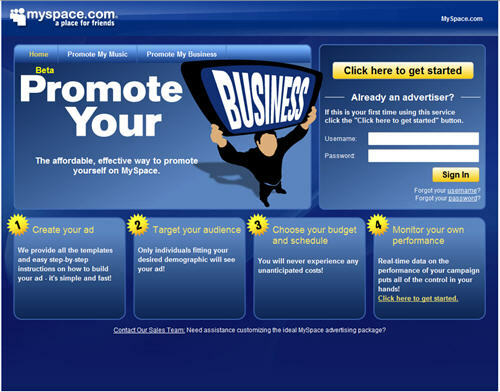 Check out “Myspace Ads Beta: First Impressions” for a detailed overview of MySpace Advertising from Nickycakes. You can sign up for MySpace Advertising at http://advertise.myspace.com/.